Thousands of educators use ThingLink for creating visual learning materials, virtual lessons, and interactive presentations that may include several types of media. This is why many have requested the option to create transitions from a regular 2D image (for example, a floor plan) to a 360 image (a 360 photo of a classroom) and back. ThingLink is the only platform that supports transitions from one interactive media type to another. This means you can have a base image or a poster that transitions to a set of 360 images or videos, and maybe back to the base image. This way a virtual tour is not limited to only 360 media, but it becomes a multimedia presentation on small and large touch screens that can include multiple paths for navigation and content discovery. No need for copy-pasting links! The new editor pulls all your previously created media into an image selector. This means you can now select the next scene for your tour with one click. If you want to add a new image, the image selector also offers an upload option. To make your images look great on any device, ThingLink’s Tour Creator features multiple content templates from plain text annotations to various combinations of text, images and embedded content. In addition to the tag arrangement, you can design a custom color scheme that will apply to all points of interest. To give your viewers an idea of the next scene in your tour or presentation, you can add a short text such as “Go to the library” or “Back to start”. Labeling will help distinguish transitions from content icons. To make your tour visually attractive, ThingLink offers hundreds of preloaded icons in various colors. In addition, Premium users can upload their own icons directly inside the editor. Organization account holders can now set their content in “My organization” viewing mode, in which case their presentations and tours will not show up in ThingLink search. Only members of the same organization can access content created by its members. This is an important feature for many schools, eLearning service providers, and corporate training organizers. To see ThingLink’s Tour Creator in action, watch this video from Andrew walking through the different features! The following months will be a transition period during which you will experience both the old and the new editor depending on which editor has originally been used for creating an image. Eventually all images and tag types will convert to open in the new editor. Going forward, all new features such as collaborative editing 360 video will be available in the new editor. How to access the new editor and the Tour Creator? 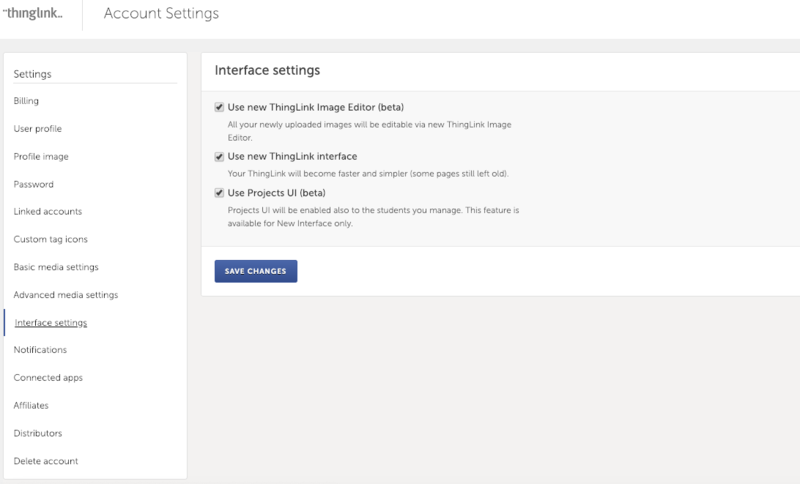 Make sure you have selected “Use New ThingLink Image Editor” the Interface settings under Account settings. This gives you access to the new editor. We look forward to seeing your work, please keep sharing your projects to the ThingLink Education groups on Facebook and Twitter!